The EL3101 and EL3102 analog input terminals handle signals in the range between -10 and +10 V. The voltage is digitised to a resolution of 16 bits, and is transmitted, electrically isolated, to the higher-level automation device. 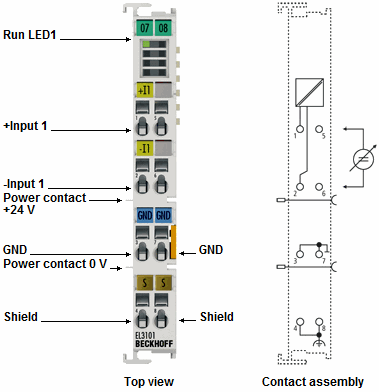 The input channels of the EtherCAT Terminals have differential inputs and possess a common, internal ground potential. 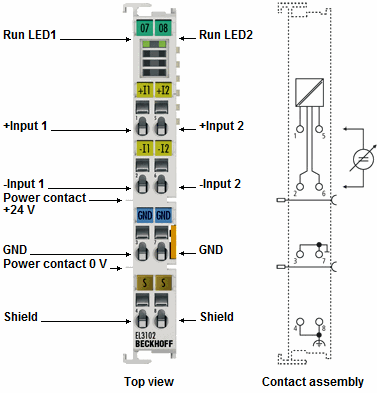 The signal state of the EtherCAT Terminals is indicated by light emitting diodes.